Today, more than at any time in the past the speed of the development of technology, along with its application in sectors such as physical security is defining the art of what is possible. If we look at the forecasted numbers, global physical security market, that consist of systems and services, worth 105.26 Billion USD by 2020 (a value published by Markets and Markets – Worlds’ no. 2 firm in terms of annually published market research reports). This value makes us to think that there is a real demand of physical security and investments in this technology and related services will increase. If we extract PSIM (physical security information management) from this number, according to TechNavio’s analysts forecast, the PSIM market in the EMEA region will grow at a CAGR of 16.7 percent till 2019. Meanwhile, IoT (internet of things) market is taking shape and the analysts predict that IoT will re-shape the world’s economy by its economic impact. As Gil Press writes in an articles published on Forbes, IoT has a total potential economic impact of $3.9 trillion to $11.1 trillion a year by 2025. According to System Integration Market - a worldwide forecasts & analysis (2013-2018) published by Markets and Markets, systems integration can be segmented into infrastructure integration, application integration and consulting. Building management system (BMS), cloud integration (infrastructure-as-a-service (IaaS)), Command and Control (C2)/Command, Control, Communications, Computers, Intelligence, Surveillance, and Reconnaissance (C4ISR), integrated communication, Data Center Infrastructure Management (DCIM) and network integration are considered categories of infrastructure integration services. If we look to applications integration services, the market is segmented to application integration, data integration, unified communication, integrated security software, and integrated social software. According to a research note published by mid of Q4 2014 by IHS, the world market for security system integration was valued at $59.5 billion in 2013 with a revenue expected to continue growing in excess of 9% through 2018. PSIM (physical security information management) is a concept that became a trend in the last 5 years. This concept is shaped by a customized solution capable to connect to multiple systems, providing the operator with a single GUI (graphical user interface) no matter the number and type of the underlying systems. What stays behind PSIM is integration. What it brings in addition to unification of systems, is intelligence. As the acronym PSIM comes from physical security information management, this concept was born from the need to connect and collect events and alarms from multiple security systems and through its intelligent layers to analyse and filter these alarms and make the user aware of the correct ones based on importance and severity. As technology evolves, as well as the need of improving efficiency in operations, it was natural to demand connecting to PSIM other systems or devices that are not security related. As BMS (building management system) is designed to connect and manage multiple building systems and devices that control different solutions such as HVAC, elevators, escalators, valves, power supplies and more, PSIM was designed to connect and manage security systems and devices. Meanwhile, as PSIM is in a continuous development, BMS became one of the sub-systems that it can connect to. Therefore, PSIM can go beyond security - from physical security to physical systems information management. This concept and solutions are being successfully implemented through integration. Integration is a term, even in most cases misused by many, that defines at glance the process of development of dedicated software capable to talk with a piece of hardware. Expanding the process, multiple pieces of hardware and their management application, build a system, but having multiple such systems, provided by different vendors and serving different roles, there is needed a software application that is capable to discuss with each system. This is possible through the process of systems integration. Integration layer is the interpreter capable to talk multiple languages but to use only one with the user. In this way, the user does not need to be an interpreter to have a dialog with his multiple systems. So this is generally what integration process does. The rest of the job is done by the software application (e.g. PSIM) that talks the languages of different systems and devices. From this point, it depends on the level of complexity, functionality and features of each application. Meanwhile, it shall be understood that such an application is developed and customized in accordance with user’s needs and operational requirements. Such an integration application not only connects to the underlying systems and devices, but reacts on events and alarms generated by them based on several scenario defined in accordance with operational environment of the user. In addition, it is programmed to support user’s policies and procedures, well defined to withstand any action that shall be adopted and followed to quickly respond and solve a specific incident. It is mandatory to remind that integration means IT and make use of network connectivity. PSIM uses it as well. The way of communication with any system and device is Ethernet. The method of communication may differ for each system and it can be native or open (different protocols) through different hardware and software layers that anyway, use Ethernet. So, as long as we have the capability to talk with security systems and devices, in the same way we can talk with any existing system, device, software application and more, once network connectivity is almost everywhere through the existence if Internet. It is possible to communicate with any device as long as you can connect to it and speak its language. At glance, this is IoT (internet of things). And PSIM can be part of IoT, or vise-versa. 30 billion IoT objects will be connected to internet until 2020. Main problem of PSIM was to learn multiple languages (connection drivers) to connect systems or devices. Similar, ONVIF standards were born to allow IP cameras connecting to any ONVIF compliant video management software or network video recorder. In this way, IoT devices shall become compliant to standards that will allow applications to make use of them. At this moment, development for PSIM reached a high level of complexity and such a solution is capable not only to connect multiple security systems from a single site/location, but also to connect to systems from multiple locations and even to connect to other similar PSIM applications in any part of the world. There are PSIM implementations serving the operations of organizations with branches all over the world and that integrate more than security. Therefore, as long as we have the possibility to communicate and we know how to communicate there is no theoretical boundary to integrate. 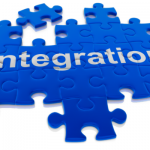 But the specific and design of an integration solution stays in the functions that needs to serve. There are many discussions around PSIM, IoT, Safe city, Smart city, Smart grid and more. Are these only ideas or they are really starting to take shape? There is still lot of room for security systems integration. If we look further than security, the question would be how is it possible to jump to a higher level as long as this integration concept is not yet completely understood. Technology is developed to withstand needs and to serve them efficiently. It is meant to make life easier and to be implemented correctly in order to match user’s operational requirements in order to bring value. The problem is still on the level of perception. Majority of users do not have technical skills, but they know their business and operational needs. A good systems integrator will know how to address these needs, what technology to use and how to implement it to withstand the needs and to improve user’s operations and business. If we look to safety and security operations, there is indeed a trend for integration. Everyone invested in different systems and technology in the past 10 years. But technology is evolving and solutions were implemented step-by-step. Therefore, we face situations where not only that different levels of technology are in place, but also different technologies serving different needs. All these represent a huge problem in operations. Different technologies, different interfaces, multiple applications, vast amount of information, no synchronization, no policies and procedures, conduct at the end to a messy situation. If this represents a real challenge for any organization that has multiple departments, each with its own operations, and having multiple locations, how is it possible to bring and merge them into a unified integrated solution that is truly capable to make use efficiently of resources and manage to share them across the enterprise or at a larger scale – across multiple agencies? Systems integration brings together IT, Security, Operations and any other department that can benefit from it. As systems integration involves networking, hardware and software, IT department is right one to handle the process. Together with an experienced consultant, a skilled and experienced systems integrator (that is also experienced in solutions architecture design), and representatives of targeted departments or agencies, it will be shared and shaped an integrated solution that is capable to connect to multiple systems, devices and third party applications, to manage them, to share their resources across the organization and most important to provide the intelligent layer that will efficiently improve the operations – this is possible through the automation of processes, appliance of standard operational procedures (SoP) and more – that are implemented into the solution. As long as the automation of processes is in place the minimum the risk of human error is. Once the integrated solution was designed as an open architecture, capable to extend and adapt, it will easily assimilate small and medium changes within entity’s organizational structure, without the need of extra charges. In this way, imagine how the enterprise can benefit from multiple systems and technologies, if all are integrated as a single solution, adapted to serve different operational requirements from multiple departments, with a unique source of informational resources, capable to intelligently share the right information to the right users across the enterprise. This will generate costs reduction, will improve operations and business and provide a greater control. As so complicated it sounds, so easy it is if you know how. What if such an integrated system will become one of the sub-systems that connect to a bigger integrated solution? In the last decade the world is facing severe security challenges and dramatic events such as 9/11, Madrid and London bombings, and most recent Paris terrorist attacks. Unfortunately these are some of the cases that show the gaps in security for every country. These gaps come not only from the missing investments or poor knowledge in choosing the correct technology, but also from the lack of defining and implementing efficient security policies. Sad to say, such situations are applicable not only at macro level, but at are common to almost any organization. If security policies are not defined, and correctly and efficiently implemented, how can we respond fast and promptly to incidents? Romania, the country where I live, can be one example of investments in different technologies, for different domains such as homeland security, public safety, critical infrastructure, transportation, emergency response authorities, and enterprises, public administrations, energy and more, meant to theoretically address efficiently to security and safety challenges, as well as enhance traffic in a crowded city for example. Who knows if these investments in different systems and solutions are correctly chosen? Who can decide if what is implemented and how, will really serve a certain uncomfortable or even worst situation? Regrettably, reality reveals that technology is not wisely chosen and the investments do not have real operational requirements behind. Fortunately, Romania and Europe, so far, were somehow avoided by major incidents that conduct to lose of human lives and significant material loses. Unfortunately, the recent incidents (local and abroad) and global situation show how vulnerable we are. Let’s make an exercise. Imagine an entity (such as an agency) that is capable to collect and monitor events and alarms from multiple systems, devices, resources and applications (video surveillance, intrusion, fire detection, fire departments, police and many more) belonging to both public and private sectors. This agency has the capability to extract valuable information from social media, gather valuable data from both public and private sectors. These capabilities are available based on an integrated solution. The same integrated solution is able to identify precisely the sources of an incident and its location, but in the same time to automatically identify and coordinate the appropriate response resources and share automatically valuable information to them and across multiple agencies that shall be involved in the response and rescue process and procedure. Identically, same key information is shared to decision makers that shall manage and coordinate the process (e.g. crisis cell). Imagine how well defined policies and procedures that are implemented in such a solution will speed up the process of handling incidents, where is no room for human error and every second matters. This solution is able to dynamically adapt to several scenarios based on severity levels and is significantly improving the response times by efficiently using necessary resources. Think that such a solution is able to intelligently detect and define threats and patterns, and to provide valuable data to improve policies and procedures to withstand any type of incident that may occur. Only an integrated solution is capable to gather and manage such an impressive amount of data, to analyse and filter it in real time, and to provide situational awareness to the right recipients. In addition, such a solution become a valuable pool of key information for different services. With the right added investigation management layer, it is possible to identify patterns and threats, connections between individuals, transactions, entities and more. Few recent examples are coming into my mind, where existence of such an integrated solution would have been conducted to different results. These tragic events, that ended with lose of human lives, showed the lack of procedures and policies as well as poor coordination among emergency response agencies. Procedures are the heart of such an integrated solution. Information is useless if we don’t know what to do with it and how to react. Existence of an integrated application allows real time extraction of vital data from correct sources (entities, agencies and systems (such as air traffic control, mobile telephony operators, and emergency response services)). This application monitors and manages emergency response resources and knows their real time location as well as their available assets. In addition, it is capable to share instantly valuable information across multiple agencies, allows real time communication channels between agencies and provides decision makers with real time data. Once an incident occurred, the application instantly identifies the level of severity and automatically applies correspondent procedure to be followed in order to quickly respond. Automatically the right rescue resources are notified by the system and automatically guided to the incident. Valuable information is automatically shared across targeted agencies based on embedded response procedures. In the same way, information is sent to decision makers; therefore, procedures, efficient management of resources and availability of valuable information in real time are some of the elements that could help winning vital time to save lives. Another tragic example can be a fire inside a club where tens of people died and other tens were severely injured. There are lots of factors that caused the incident but we can extract from it some problems. Above the administrative and legal issues that were not respected, also from the lack of strict policies and the guaranty that they are applied, let’s look again on emergency response authorities and their resources. If the same entity/agency, from the above example, is receiving real time fire alarms together with real time video footage (from site CCTV system or from people’s smartphones), alarm that pops up automatically on operator’s screen, based on embedded operating policies and procedures, the system is instantly notifying appropriate response teams together with scene information (such as fire alarm, video images from the scene, an estimated number of casualties). This is valuable information that would have been helped to send from the beginning the necessary rescue resources. Scanning social media can bring upfront to operators information about such venues and concerts. In this way, having access to local data (appropriate video cameras, fire detection systems, valid authorizations or any other valuable information) and based on implemented procedures, the application can alert the operators to pay attention to these specific locations. Such an integrated solution that is fed with valuable data/information from multiple resources such as systems, sensors, social media and more, is capable to automatically define patterns and treats and provide them on severity levels, and share this information and alerts in real time to the right recipients. So why don’t we wisely invest in technology? It represents the hands of operational needs, policies and procedures that have to be well defined. As such solutions are not plug-and-play, there is a gap between solutions providers / systems integrators and users. Users run away from technology due to various reasons, such as lack of understanding, not to be blamed, and from here the perception that technology is expensive. That is the real challenge of solutions providers / systems integrators to make users understand the real value of technology, wisely selected, implemented and integrated into a solution designed in accordance with the needs and requirements of user’s operations. Video surveillance, access control, fire detection, intrusion detection, building management, sensors of any kind, devices, databases, asset management, third party applications such ERPs, CRMs, social media and more, are systems and solutions that are commonly implemented and used for safety, security, business and operational purposes. Make sure you have correctly chosen and implemented them as they will provide valuable information in order to detect threats, identify patterns, and provide tools to efficiently respond to incidents, and protect your business and most important to protect lives. Technology is useless unless it is part of a solution whose architecture was designed to serve needs. A good solution will always pay in a way or another for its’ investment as long as it is correctly chosen and implemented. It’s all about value!